Nearly one-third have obesity or are overweight. Among high school students, 14.8% reported having obesity; another 15.6% reported being overweight. 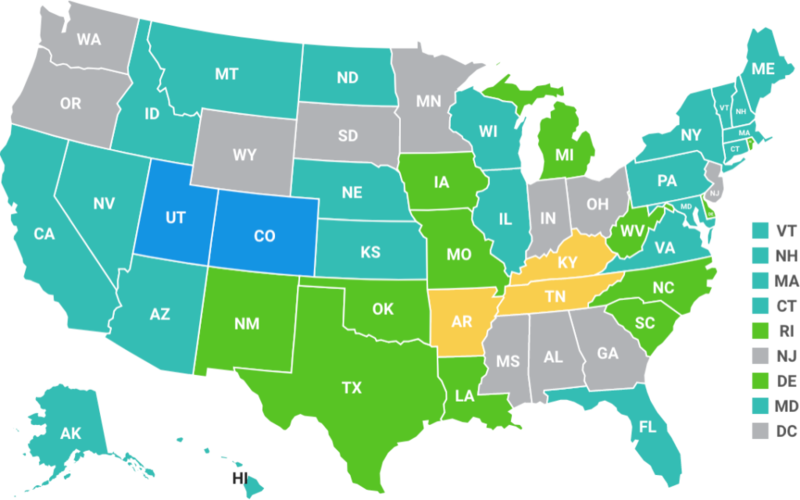 The levels of obesity varied considerably across states—from a low of 9.5% in Colorado to a high of 21.7% in Arkansas. Physical activity levels are low. National guidelines recommend that adolescents get at least 60 minutes of physical activity every day. 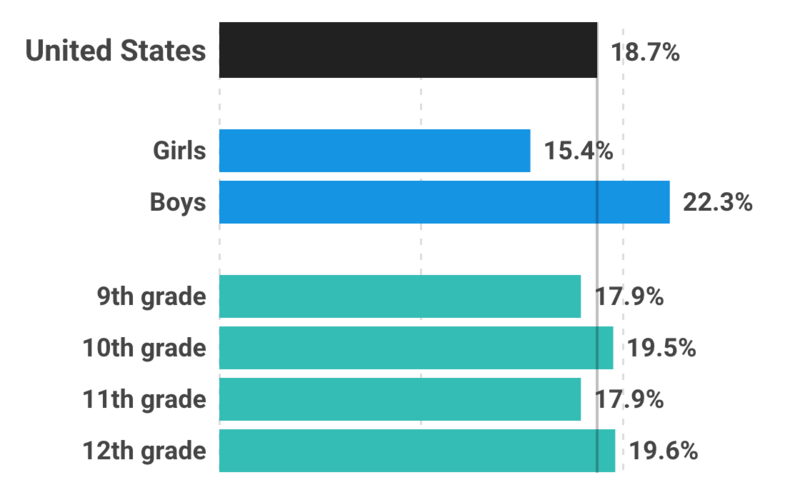 The latest data show that 73.9% of high school students don’t meet that standard. The survey also found that 43% spend three or more hours per day playing video games or using a computer for leisure. Many do not eat breakfast, fruit or vegetables every day. Only 35.3% of high school students eat breakfast daily; 40.6% reported not eating vegetables daily, and 39.2% did not eat fruit or drink 100% fruit juice at least once a day. It’s water over sugary drinks. 75.4% of respondents reported having at least one bottle or glass of water daily; 18.7% drink one or more sodas daily; and 12.4% had one or more sports drinks daily. Serious racial and ethnic inequities persist. Compared with white students, black and Latino students had higher rates of obesity, were less likely to meet physical activity guidelines, and had lower prevalence of eating breakfast each day. State-by-state rates of obesity according to self-reported data by U.S. high school students. Reports from U.S. high school students about daily consumption of soda, breakfast, fruits and vegetables. Reports from U.S. high school students about physical activity, physical education and daily screen time. We asked Holly Hunt, Chief, CDC’s Healthy Schools, to provide some insight about the latest data. Q: What do these data tell us about high schoolers’ nutrition and physical activity habits? A: These data can help us identify where more efforts are needed to help teens eat healthier and be more active. For example, schools and afterschool programs play a critical role in helping all kids grow up healthy. This can be especially true in underserved communities where families lack access to affordable, nutritious foods and safe places for play. Offering healthy meals, snacks, and drinks throughout the day, providing time for physical activity, and educating students about healthy options are some strategies that schools and afterschool programs can put in place to help kids establish lifelong healthy habits. Q: What can we learn about trends over time from the YRBSS? Should we compare 2017 data with previous surveys to determine if behaviors or obesity rates are changing? A: It’s important to examine the data to monitor trends over time. We know that there have been no dramatic changes over time. Rates of adolescent obesity rose from 10% in 1999 to 15% in 2017 but have plateaued for the past few surveys. 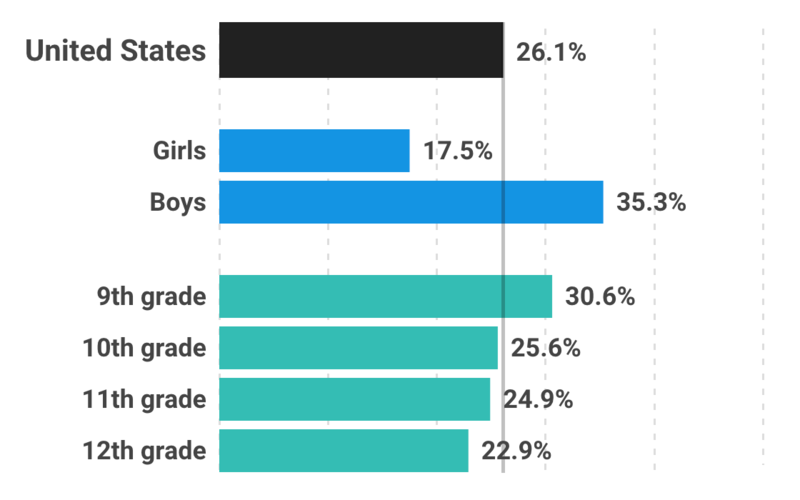 However, the prevalence of certain behaviors does change, or we might see changes over time among sub-groups of the survey (e.g., girls or boys, racial/ethnic groups). Q: How are states selected for each survey? Why are there no data for my state in the 2017 survey? A: The YRBSS is available for all states to administer. Four states—Minnesota, Oregon, Washington, and Wyoming—don’t participate in the YRBSS. And among the states that do participate, some don’t have a high enough response rate to provide meaningful results. This is why some states don’t have data for every biannual survey. Q: How accurate are self-reported responses from high school students? A: According to research, it’s as accurate as data self-reported by adults. The survey does include reliability checks to help determine whether students falsify answers, and it’s a small percentage.